If you’re not familiar with the term Google Doodle, it’s the temporary alteration of the logo on Google’s homepage. Google Doodles first appeared in 1998 and are now a regular feature on the search engine’s homepage to illustrate a range of interactive games and drop down articles to commemorate holidays, events, achievements, or people. Those who create the Google Doodles are called Doodlers. I’ve only recently started paying attention to the Google Doodles. I’ve always been fascinated by gnomes. 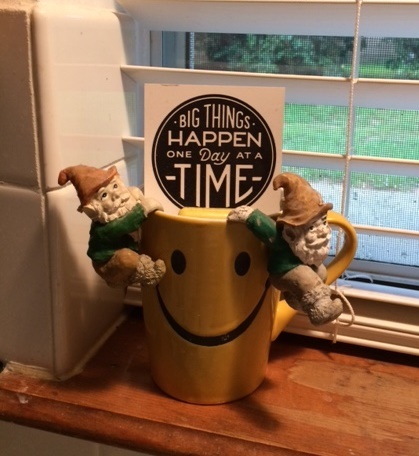 These gnomes live on my kitchen windowsill. That’s why the Google Doodle gnome game caught my eye. Gnomes are diminutive creatures that can live below the surface or inhabit gardens. All Gnomes have long, shaggy beards and pointed caps. History traces their roots from 13th century Anatolia to 16th century Italy to 19th century Germany. Myths, legends, and fantasy fiction attribute good and/or bad qualities to the creatures depending upon the needs of the individual storytellers. You’ll find gnomes in the pages of such fantasy fiction as C. S. Lewis’s The Chronicles of Narnia, J. K. Rowling’s Harry Potter, Terry Brooks’ Shannara series, and the novels of J. R. R. Tolkien. The garden gnome – the one Google Doodle celebrated – originated in the Thuringia mining area of Germany. The local artisans hand carved the little statutes with shaggy beards and pointy hats. Today, you find most garden gnomes are painted, wear red caps, and hold various garden tools. According to legend, a gnome protects your garden and brings good luck. 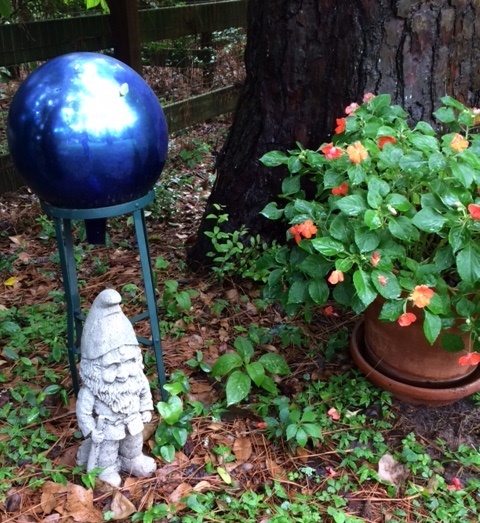 My concrete gnome has been watching over my flowers for years. He was always grey and he’s beginning to show wear. May be time to give him a coat of paint and a red hat. If you want to give the interactive Garden Gnome Google Doodle game a try, click on this link. It’s such a relief to discover my dead garden is not entirely the fault of my ungreen thumb. I just don’t have a gnome.